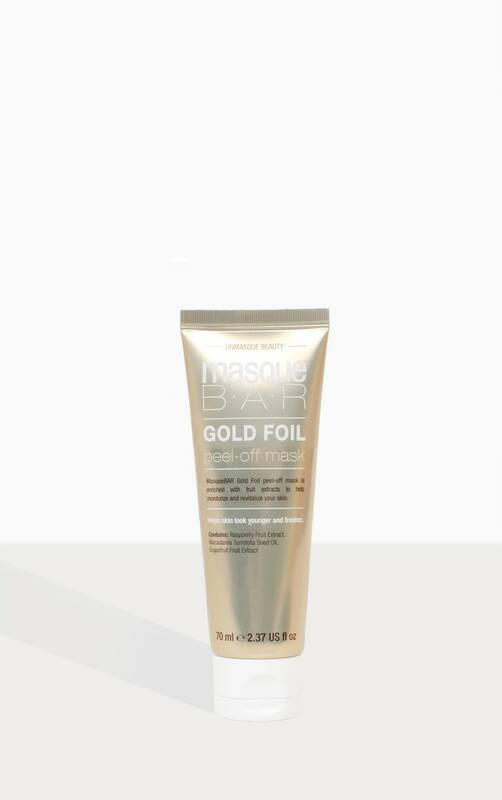 MasqueBAR Gold Foil peel-off mask is enriched with fruit extracts to help moisturize and revitalise your skin. Contains: Raspberry Fruit Extract, Grapefruit Fruit Extract, Macadamia Ternifolia Seed Oil. Apply thin layer of oil peel off mask onto cleansed skin. Leave on for 10 to 15 minutes until mask becomes completely dry. 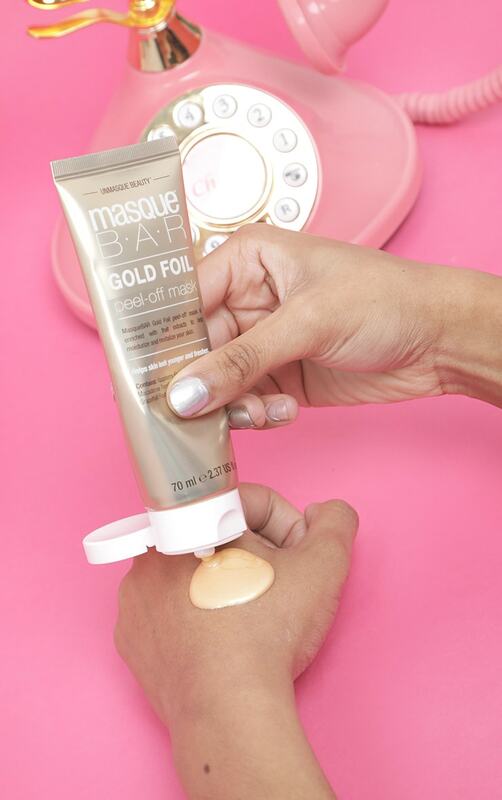 Gently peel off mask in a downward motion from outer edges and rinse off with warm water, or facial toner. Water(Aqua), Polyvinyl Alcohol, Alcohol Denat., Dimethicone, Butylene Glycol Dicaprylate/Dicaprate, PVP, Polyglyceryl-6 Stearate, Mica (CI 77019), Macadamia Temifolia Seed Oil, Methyl Gluceth-20, Betaine, Butylene Glycol, Titanium Dioxide (CI 77891), Synthetic Fluorphlogopite, Rubus Idaeus (Raspberry) Fruit Extract, Acrylates/C10-30 Alkyl Acrylate Crosspolymer, Triethanolamine, Rosin, Chlorphenesin, Polyglyceryl-6 Behenate, Caprylyl Glycol, Iron Oxides (CI77491), 1,2-Hexanediol, Propanediol, Hydroxyethylcellulose, Disodium EDTA, Tin Oxide (CI 77861), Illicium Verum (Anise) Fruit Extract, Aronia Arbutifolia Extract, Citrus Paradisi (Grapefruit) Fruit Extract, Glycine, Serine, Cysteine, Aspartic Acid, Alanine, Argininge, Isoleucine, Tyrosine, Threonine, Phenylalanine, Proline, Histidine, Fragrance (Parfum). For external use only. Avoid using on skin sensitive to bandages or peel-off facial masks. In the event of eye contact, rinse with water. Do not use on skin that is broken, irritated, or sunburnt. Stop using and consult with your doctor if skin becomes red, swollen and/or itchy irritation or other discomforts, or occur after exposure to direct sunlight. Directions for storage and handling; Keep out of reach of children.  Do not store in hot or cold temperature, or under direct sunlight.